Have you ever felt irritated from the double-clicking process in Windows 7 PC? Do you want to change mouse from double click to single click in Windows 7? If “Yes” then after reading this guide, you will be able to solve your problem. Enabling single click will not only provide you comfortability but it will also increase your work productivity and will help you to save lots of time. After enabling, you will be able to open software, folders and files just with a single-click. At first, Download I’ll Click program from here. After that extract the downloaded Rar file with the help of freeware 7-Zip utility and then run I’ll Click program. After running the program, you’ll see an I’ll Click icon in the system tray from where you can customize your mouse actions. Now make a right-click on I’ll Click icon to open the context menu and then select the option of single click – > double click. That’s it! From now you will be able to open the software, file and folder shortcuts just in single-click. 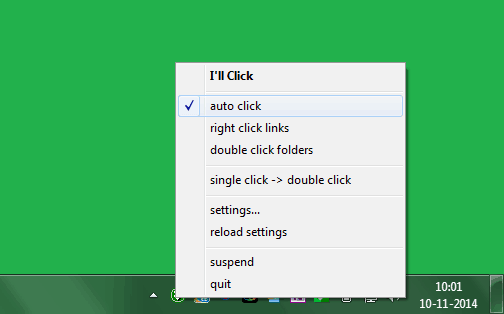 “Auto click” is also one of the most popular features of I’ll Click program. Selecting the option of Auto click from the context menu will allow you to open website pages without clicking on the website links. Only you have to move your cursor over the webpage link and the webpage will opened. The I’ll Click software comes with several other useful programs like Hot Spots, Hide Idle, Hideout, Long Click, No Drags etc that makes mouse customization perfect. Thus we can say, I’ll Click is the most appropriate software for mouse customization. The most important thing of this program is, it’s compatible with all Windows operating systems. If you found above mentioned information useful for you then feel free to share your view with us through comments. Or to get more interesting tutorials, Windows tips and tricks, step by step guide check out our Windows 7 tutorials section.